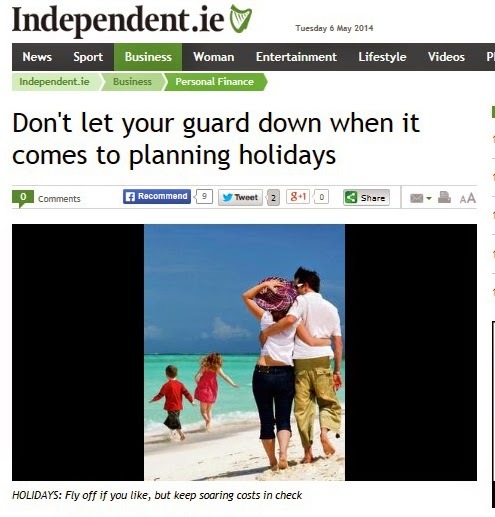 The Irish Independent had an article on Sunday 4th May -"Don't let your guard down when it comes to planning holidays"
Featuring information on where to park your car at Dublin Airport, it also covered the Car hire excess insurance waiver and Travel insurance subjects. No insurance companies were suggested however. With Car hire excess insurance Sinead Ryan the article's writer said "Car hire is a great way to get around, but fraught with added expense. If the car is damaged in an accident, you could have to cover the first €1,350 of damage before the car hire company's insurance kicks in – even if you're not at fault for the damage. All car hire companies will insist on credit card bookings to recover this money if they need to"
Well if you are looking for an Irish company that can provide Travel Insurance and Car Hire Excess Insurance take a look at what Blue Insurances has to offer. Find out more here By the way they also offer Pet Insurance, Wedding insurance, Gadget insurance and Breakdown insurance as well.